There are few holidays that I don't get that excited for, and Valentine's Day definitely is one of them. Where Christmas and New Years get me incredibly hyped up and ready to celebrate, the day in mid-february just doesn't do it for me. It has nothing to do with wether I am in a relationship or not, I just feel like it's overhyped and commercial. However, I do like all the cute nail art designs that come out during this time of the year, so I wanted to bust out some of my dotting tools and create a little special nail art for this week. I couldn't stay away from the shade I've been rocking for the last two weeks, Essie Master Plan. So many people compliment me when I wear this shade, it's a positivity magnet. Wanting to keep it simple I only added a few hearts in pink and white and placed some dots in random spots.It's relatively easy, but to add a little something extra to this post I did a step by step tutorial on how to achieve to create the hearts for yourself. It's open to personal interpretation, and you can experiment with colors! I think it would look great with white and red as well. 1. 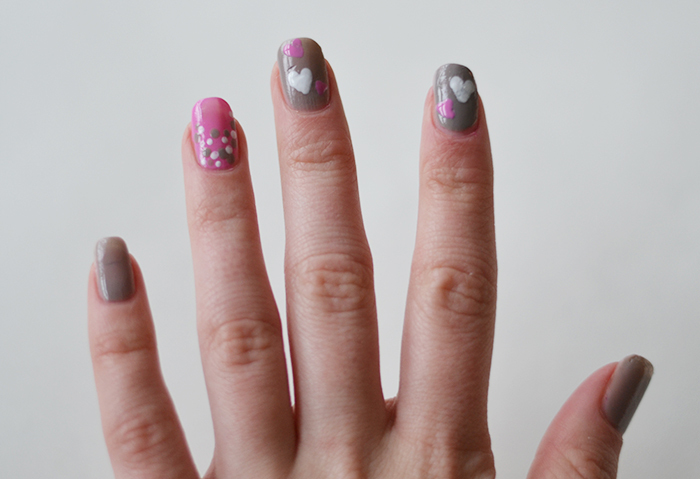 Gather your polishes, I used Essie's Blanc and Master Plan and the Ciaté color Candy Floss 2. The tools you'll need are several different sizes of dotting tools. These are really easy and cheap on eBay. 3. Paint all nails except your ring finger in the base shade Master Plan 4. 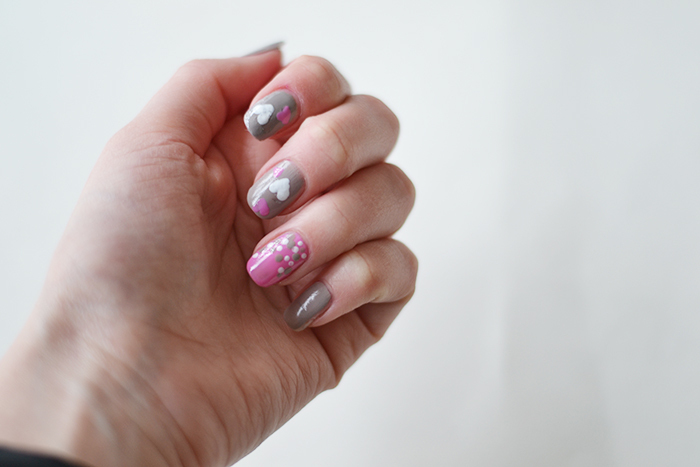 Paint the ring finger with the accent shade Candy Floss 5. Load up your dotting tool with the white polish 6. Place two dots a little apart on your nail 7. Take a smaller dotting tool with the same white polish and drag a line at angle from both dots, creating the outline of the heart. Fill in any gaps with more white polish. 8. Your result! Repeat this in other colors on as many nails as you wish, keeping the ring finger free 9. 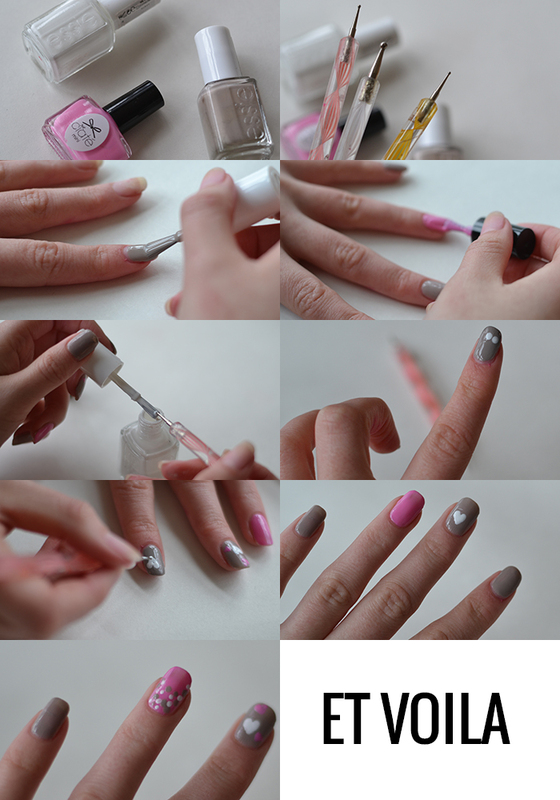 Place random sized dots on your ring finger nail and you're done!